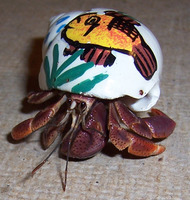 I came up with 3 Valentine's Day candy names for my new crab, but I'm not sure what one I will choose. What one do you like the best? Truffles is such a good name! Last night I was watching a bit of My Kitchen Rules (MKR) and they used truffles..